Chelsea boss Maurizio Sarri is expected to have Eden Hazard available when his side face Crystal Palace in the Premier League this weekend. The Blues are in action against Derby County in the League Cup in midweek, and it’s likely that comes too soon for the Belgian international after he sustained a back problem in the draw with Man Utd earlier this month. He has since missed the wins over BATE Borisov and Burnley, with Chelsea coping well without him as they remain unbeaten in the Premier League and just two points adrift of the league leaders. However, given the 27-year-old has bagged eight goals and three assists in just 11 appearances so far this season, it’s evident that having him back in the line-up will certainly help them maintain their impressive form and their hunt for major trophies this season. As noted in freelance injury analyst Ben Dinnery’s tweet below, Chelsea assistant manager Gianfranco Zola has delivered the latest update on Hazard’s injury, and he has dropped a massive hint that the Blues talisman is expected to be fit to face Palace at Stamford Bridge on Sunday evening. There appears to be little sense in risking him against Derby, as although Chelsea and Sarri will want to advance and take a step closer to winning silverware this season, the last thing they need ahead of the busy festive period is to lose Hazard to a fresh setback. With that in mind, it’s unlikely he’ll feature in midweek, but as per Zola above, it sounds very promising for Chelsea ahead of the weekend. 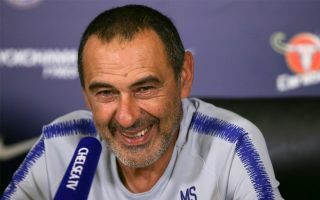 Meanwhile, Zola added that Pedro, Olivier Giroud and Ethan Ampadu are all doubts to face Derby as well with Sarri given a selection headache as he’ll have hoped to rotate and rest key individuals.